It seems almost surreal to finish another week of school and have it be so relaxed and enjoyable. Where is the stress? I think we have left it behind and have reached the point in Mr. B’s academic life where things are sort of on auto-pilot for me. The system is in place and the routine is manageable. This was a “B” week for us so that means we had a meeting to go over the last two week’s worth of work. Grapes of Wrath: Mr. B said he had to finish the book early regardless of my “slow reading” schedule. Okay, so I will be flexible with that and start him on the writing assignment a little early. He wants to read it over again according to my schedule…sigh. I can’t blame him for reading ahead but I am trying to encourage careful reading the first time through. Always something to hone as you work with high schoolers. Anatomy: Have I said before that Mr. B is sharp? Sharp in the sense that he can discern when the text he is reading does not give him enough detail. In a way, this is a good thing….it may not be the perfect text but if Mr. B is encouraged to dig a little deeper using the internet and another college text I have as a reference on the shelf, that is a good thing in my book. His sketching skills are coming in handy as he makes his own diagrams for his notebook pages. History Timeline: His timeline is filling in with all kinds of interesting things. 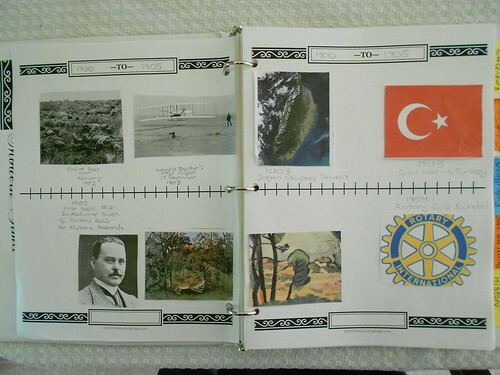 Using the Book of Centuries pages from NotebookingPages.com has been a simple way to tie the timeline work in with his regular notebook pages. Government: Mr. B has started really paying attention to the presidential campaigns as part of his government and current event studies. This is such a great time to be working on a government course since he is able to see the actual process and make connections to his online course. I am thinking we may use notebook pages to record a sort of campaign timeline…need to take advantage of his interest. There is a new link-up over A Teaching Hearts! Angie from Petra School clued me into this group with her post this week and I think we will share our weekly study music appreciation with the link-up from now on. Our current composer is Bela Bartok…a Hungarian composer. Mr. B has been listening with headphones lately so I don’t get to listen as often as I would like. He did pull them off this week to share a bit of what he was focusing on and to tell me he thinks it sounds like everyone is just playing whatever they want however they want….he was right. You can see for your self: String Quartet. Did you make it through that? I had to turn it off after about four minutes….hard on the ears. I will end my wrap-up on that note…. Thanks for joining us! I have been thinking about purchasing some of your things. I really like the sample pages that I have seen. I have a 4 yr old and a 9 year old. Which product would you suggest for me to use so they both can begin together? Or should I just stick with teaching the 9 year old and let the 4 year old “catch his learning” and participate as he wishes. Hi Barb! How encouraging to read about Mr. B’s autopilot educational pursuits. He sounds like a true autodidact! His century book is inspiring; this is one area in which we began with (my) high hopes and then fell flat. Ah, well. I would pick a grade that goes along with your son’s history study and then include the younger one in as many of the activities as you can. Picture study works with all ages and there are ways to adapt any HFA plans to make them more friendly for more ages. You can email me anytime to ask specific questions, happy to help. Stopping by from the blog hop! 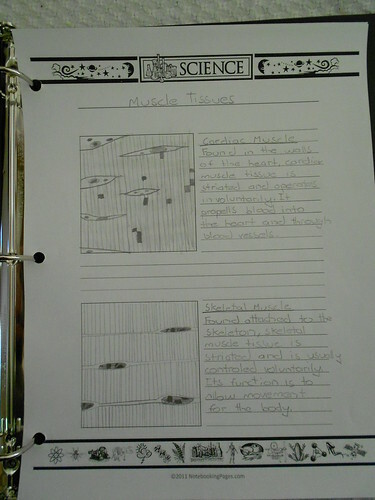 Excellent, detailed drawings in the science notebook! How wonderful! Love this in so many ways! Your examples of your son’s independent learning and glimpses into your homeschool. You and Angie are inspiring me with composer study!